I must admit that I do really love looking at baby clothes. Most of Baby's clothes are second hand, when my local charity shop rarely sells a (usually brand new) baby item for more than 50p, I just can't justify the £22 for 3 babygrows that Mamas and Papas charge. I'm pretty good at sniffing out a sale though, or finding items that I love online and then sourcing them cheaper elsewhere. 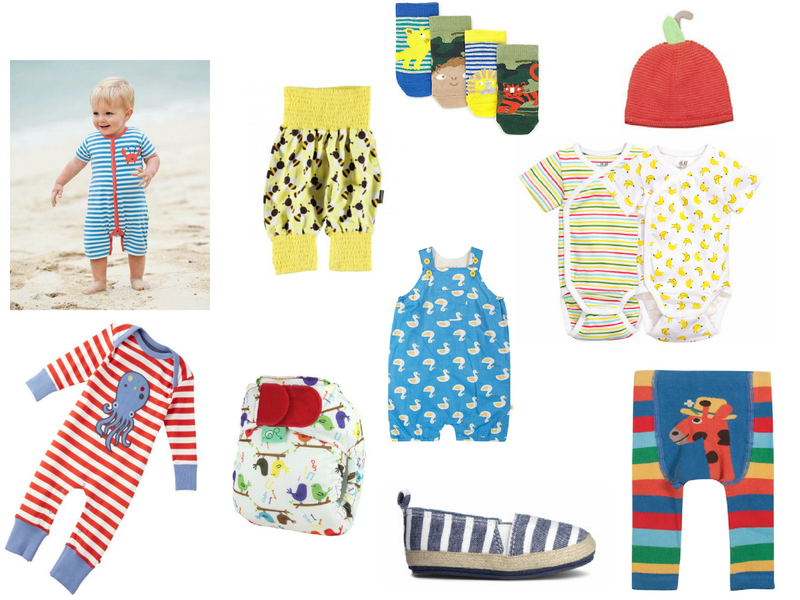 I thought today I'd put a little style board together, partly to give you an insight in to the kind of thing partly to give readers and idea of what you might see Baby in when he/she arrives, and partly to give me some window shopping opportunity. This board features brands such as Frugi, Maxomorra , Piccalilly and H&M Conscious, all of whom use exclusively 100% organic cotton in their baby clothes (there are a few other High Street brands thrown in too) - I have to admit, whilst this was initially posted as a "wish list" - I do already own the apple hat! Everything is listed at it's full RRP below, if you want to find a bargain you'll have to go hunting! Rock Pool (crab) Romper: £18 by Frugi here. Octopus Playsuit: £21.99 by Piccalilly here. Bumble Bee Yoga Pants: £15.99 by Maxomorra here. Tweet Nappy: from £10.49 by TotsBots here. Animal Socks (four pairs): £5.00 by Marks & Spencer here. Duck Dungarees: £18.00 by Frugi here. Espadrilles: £5.99 by H&M here. Apple Hat: £6 by Mini Club at Boots here. Stripes and Bananas Vests (2 pack): £7.99 by H&M Conscious here. Rainbow Giraffe Leggings: £13.99 by Frugi here.